Microsoft, Nintendo, Sony, Google and all the big-screen TV makers want to own the the all-purpose living room entertainment system of tomorrow. Smart TV systems, which will incorporate movies-on-demand, gaming, web surfing, videoconferencing, home automation and more (even TV shows!) are likely to become the next big opportunity for content-driven platform companies. But is time running out for Apple to make its move? The surprising answer is: No, not really. Apple’s got plenty of time. And there’s no need for Apple to make a TV set, either. Microsoft Xbox 360 has been around for more than seven years, and the company has sold about 70 million of them. The game console manages all your home entertainment, plays optical disc movies, downloads streaming content from Netflix and other sites, including streaming music from Xbox Music, lets you surf the web and do social network, connects you via chat or live videoconferencing and more. A newish Xbox SmartGlass initiative enables interaction between TV and mobile devices. Importantly, Microsoft decided to support non-Microsoft platforms. For example, the first Xbox SmartGlass for Android shipped this week. That means once you’ve entered in all your Xbox Live vitals in the app, you can waltz into any room with an Xbox, connect via WiFi, and then interact with that installation of Xbox like you own it. You can use the app as the TV remote control, display game stats on the phone while you’re playing a game on the TV or even use your phone as a controller for game play (only with games that explicitly support the feature). Control streaming music over Xbox Music. You can even use the phone as a keyboard for typing on the TV while surfing the Web. One huge usage for Xbox SmartGlass is augmented sports. While you’re watching a game, the SmartGlass app constantly displays real-time scores, stats and other information about what’s happening on the TV. The iOS version of Xbox SmartGlass is expected to hit the App Store soon. Microsoft is rumored to be developing a successor called the Xbox 720, code-named “Durango,” which could be out in time for next year’s holiday season. Interestingly, the console is rumored to have no optical drive (like the new iMac, and for the same reasons). Another credible rumor says the Xbox 720’s controller will be like the Wii Us — it will have a touch screen on the controller itself. If that rumor is true, it’s also likely that unlike the Wii U controller, the Xbox 720’s will be optional, and that you’ll continue to be able to use your own tablet or phone as a controller or a peripheral to the TV via Xbox SmartGlass. The coolest rumor surrounding the Xbox 720 references a Microsoft patent for a method for using a gaming console to augment on-screen game play with projectors that turn the entire room into the gaming environment, including the walls, floor and ceiling. Combine that with a rumored Kinect so advanced that it can read lips, and you’ve got something like a rudimentary Star Trek Holodeck. Nintendo this week made a big play for the living room, too, with its Wii U system. Nintendo says they’ll probably ship 5.5 million Wii U game units between the availability date of November 18 and the end of March. The Wii U costs $300, which Nintendo is selling at a loss. The Wii U comes with a controller called the GamePad, which itself is a tablet computer, albeit one more similar to an old-and-busted UltraMobile PC idea, with game-controller joysticks and buttons on each side of the screen, than the new-hotness touch tablet. The Wii U enables subscribers to sign up for the Wiiverse service, which lets them do video chat, download games and so on. Users can watch movies from Netflix, Hulu Plus, Amazon Instant Video, and YouTube. And an NFC chip built into the controller enables the wireless installation of software, and also NFC-based credit card purchases. While Nintendo sees its Wii U controller as its “secret sauce,” given that it can do things tablets cannot do, the controller is in fact its fatal flaw. The general concept of fluid interaction between TV and tablet is becoming universalized. And while Wii U users are stuck with a proprietary tablet, everyone else will be using their own personal tablets and phones, as well as better-supported app stores to choose from. But the entire model is based on the idea that what’s on the TV can be taken “to go” on the small screen. When watching the large screen, the small screen becomes an intelligent augmenter or controller of what’s on the big screen. Sony’s Playstation 3 also provides TV and movies downloads via the PlayStation Store, and limited socializing on PlayStation Home. Sony has hinted at limited collaboration with various companies on mobile-TV interactivity. But for the most part, Sony is off in the weeds, and looks like its role in the living room of tomorrow will be the production and sale of overpriced TVs. The Google TV platform, although popular with some Android geeks, also appears to be going nowhere in the broader consumer market, but it’s reasonable to assume that Google will keep hammering away at the idea until it succeeds. The key features of Google TV are that it runs Android, and is designed to support a robust app ecosystem and be customizable by TV makers. The combination of Google tweaking and improving on the one hand, and third-party TV and app makers on the other adding cool new features, could make Google TV a compelling living room platform someday. The major Korean and Japanese TV makers offer Google TV sets, as well as their own proprietary “Smart TV” features as a hedge against Google. But I don’t see any of these catching on as app development platforms or central hubs for living room entertainment. 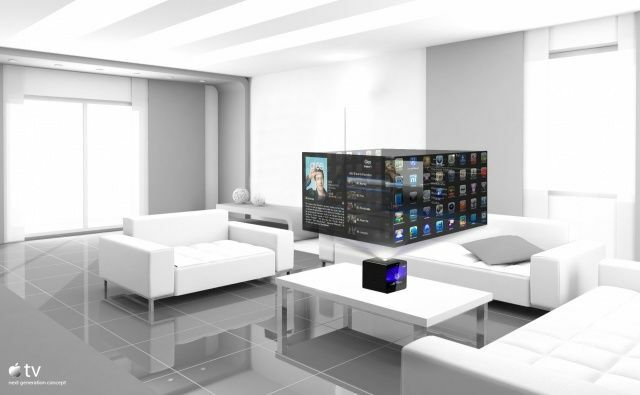 Despite this long list of players and wide variety of approaches and technologies, the future of the living room is becoming clear. Tomorrow’s TVs will do everything. They’ll be Internet computers, game consoles, multimedia entertainment systems, video phones, and — importantly — will be controllable via arbitrary mobile touch devices. And they’ll offer sci-fi user interfaces like in-air gestures and voice command. The new TVs will seek to break down the walls between types of media and even types of online activities. For example, you tell your TV: “Batman,” and it will instantly provide first the option to download and watch the HD version of the most recent “Dark Knight” movie that has been made available online. Next, it will offer you tickets to the nearest theater showing the current release of the series. Then Dark Knight and Batman console games, then Batman TV shows and cartoons, then Batman graphic novel and comic downloads for your tablet, and the list will go on and on. Your TV will have your credit card, so whatever you choose will be an instant gratification experience. There are two reasons why Apple has plenty of time to enter, then dominate, the living room of the future. The first is that nobody except Microsoft is making any significant headway. All the other players are stumbling along with non-existent or irrelevant attempts that have no chance of catching fire in the market anytime soon. The second reason is that these living room systems don’t involve serious lock-in. The cost of investing in, say, an Xbox or Wii U system is $300. The biggest lockin is for content. But when you’re talking about home entertainment, where people are used to constantly shelling out money for new content, the lock-in factor isn’t a major barrier to switching platforms. If Apple enters the market with a killer solution in a year, two years or even three years, it would be trivial for consumers already invested in existing platforms to rip all that equipment out and start over. Or, they could add the Apple system for their main entertainment and communication hub, and keep, say, the Xbox around for those late-night Call Of Duty sessions. Why not? In order to succeed, Apple needs only enter the market with a markedly superior solution any time in the next few years. The one thing Apple does not need is an Apple TV set, because that’s unnecessary for Apple to own the living room. None of its serious competitors are doing it with a TV set. And, in any event, even if Apple shipped a real TV, it still would need a stand-alone box in order to capture any significant market share. The decision by Apple to sell or not sell an Apple TV set is completely unrelated to any effort to own the platform that people use with their TVs. It’s interesting to note that Apple already has mature versions of all the major component parts of a living room platform, including the mobile platform (iOS devices), the sci-fi interface (Siri), the content store (iTunes), the cloud storage service (iCloud). The biggest barrier may be Apple’s desire to own it all. Specifically, I’m worried that Apple may not want to incorporate optical media, for example, telling consumers that content they watch on their TVs should come only through iTunes. I’m worried that they may not want to open up FaceTime to other video platforms. Nobody’s going to replace their home phone with FaceTime on TV if they can call only other Apple users. One interesting opportunity for Apple is the recent shipment of Ultra-HD TVs from LG and Sony. An Ultra-HD TV is really a TV that matches Apple’s definition of a “Retina” display. Ultra-HD TVs have more than eight million pixels of resolution — at least 3,840 horizontally and at least 2,160 vertically. They’re monstrously expensive. The LG and Sony models are each more than $20,000 — which means they’ll cost $5,000 in two years and $3,000 in three. They both have WiFi built in, and support passive 3D. It will take broadcast and cable TV many years to start broadcasting at this resolution. Even Blu-ray distribution probably won’t start for two years. Apple is trying to lead with resolution on tablets and laptops; it makes sense that they should do the same in the TV space — not with a TV, but with content. Apple is in a position to be first to market with a wide selection of Ultra-HD streaming content. I believe Apple still has time to enter the living room market at its leisure and dominate it with the right product. I’m not saying that Apple is guaranteed to win if they enter the market. They could very well fail, and Microsoft could win. But what I’m saying is that it’s not too late for Apple. Apple’s still got plenty of time to own the awesome, all-important living room of the future.